The month of November marked the start of something new at the Solvay Union Free School District – Solvay Success Academy. The program is funded by a grant from the New York State Education Department and is open to students entering ninth grade at Solvay High School. Solvay Success Academy gives students the opportunity to earn 24 to 60 college credits during their four years at SHS. Solvay Success Academy has been in development at the Solvay UFSD since this past summer. In June 2018, the Solvay UFSD was awarded the Early College High School Learning Grant by the New York State Education Department. Solvay UFSD was one of 19 schools in the state selected to implement the Smart Scholars Early College High School program. Upon award, the administration quickly worked to get the program up and running. After plenty of partnerships, coordination, and hard work, the program, now called “Solvay Success Academy,” launched for the 2018-19 school year. Solvay Success Academy is open to SHS students entering ninth grade, and students must apply in order to be accepted into the program. With this program, students are able earn 24 to 60 college credits during their four years at SHS. Solvay has partnered with Onondaga Community College for the program, allow students to take classes at SHS that will earn them both high school credits and college credits from OCC. Thanks to the grant funding, these classes are offered to students at no cost to them. During their four years in the program, students are also introduced to the college-going culture, through a variety of after-school activities and study sessions. This introduction help students become more familiar with the college environment and culture. After four years, students are not only well prepared for college, but will have earned the chance at a degree of their choice in Computer Science, Engineering Science, or Math/Science from OCC. While Solvay Success Academy focuses on college classes, the program also encourages students to enjoy their time in high school. Solvay Success Academy allows students to participate in any extracurricular activities they may be interested in, such as band, chorus, drama, and athletics. This is one of the main objectives Solvay Success Academy Coordinator Keith Lasher focuses on during his time with students. 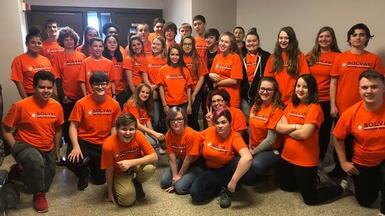 “High school only comes once in a lifetime and we want them to be high school students first,” said Solvay Success Academy Coordinator Keith Lasher. "This is just one of the many benefits for students in the Solvay Success Academy -- students shouldn't feel pressured. While there are high expectations related to college-level courses, this is still high school and we try our best to help teach our students the balance involved in that." So far, the program has been a success. In November 2018, a total of 34 students were accepted into the Solvay Success Academy. A Welcome Night was held in early November, to celebrate the students who were accepted into the program. In early December, the group visited the OCC campus together for a welcome event. For more information about Solvay Success Academy, contact Solvay Success Academy Coordinator Keith Lasher or visit the Solvay Success Academy webpage.